In an attempt to link the present with the past, one flag in particular, named Old Glory, has traveled all over the world. In an effort to remind those near and far, Old Glory proudly represents those who have courageously defended our nation and its allies. He started the flag tour in 1999, when Old Glory was raised at Valley Forge, marking the beginning of the Old Glory Travels America’s Freedom Tour hosted by Century Link America. “The mission of the Old Glory Tour is, in part, to remember and commemorate important events of our history, to honor the service and sacrifice of veterans and the fallen who helped shape them, to salute members of the armed forces, to recognize the firefighters, police and EMT’s who protect our freedom domestically, to inspire and educate our youth and to celebrate the freedoms and spirit of America our flag symbolizes,” said Pawlewicz. As tensions grow between North and South Korea, we are reminded of the Korean War not so long ago. June 25th of 1950 began a war that has still seen no conclusion. The American Flag flew for the south during the three year conflict. It flew against communism, and held those we lost in its bold stripes and stars. In January of 2005, 30 active-duty service members took the Oath of Allegiance in Seoul and became U.S. citizens during a special overseas military naturalization ceremony. During that ceremony, Old Glory was unfurled and presented as she welcomed our newest citizens. Now, 12 years later, Old Glory made a trip to Osan Air Base to fly in honor of those who fought, those who died, and those who are ready to do the same to uphold freedom in South Korea. 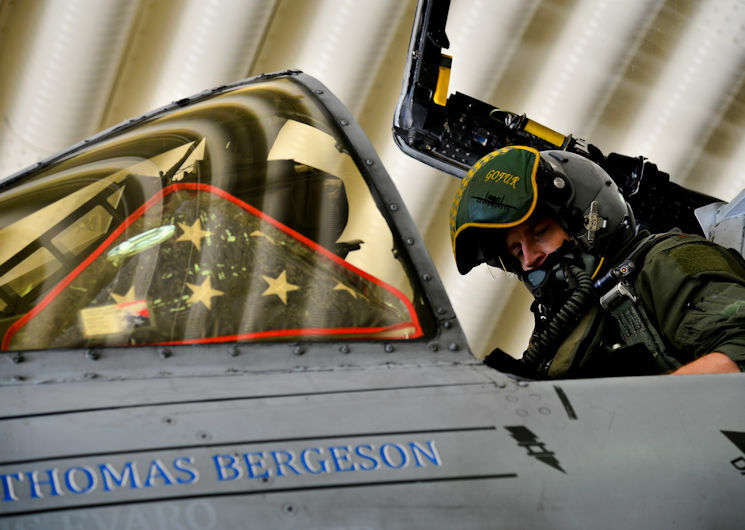 Old Glory was flown in a U-2 Dragon Lady at an altitude of 60,000 feet above the earth’s surface and took a ride in an F-16 Flying Falcon with the commander of the 51st Fighter Wing, Col. Williams Betts. She also made one of the most dangerous flights an American can make. She flew at the 38th Parallel, the DMZ, in an A-10 Thunderbolt II. After sharing its history and capturing new memories, Old Glory will return to Washington D.C. to be one of many heroes during a Veteran’s Day Ceremony. Korean War Veterans, holding Old Glory, will lead the procession of veterans groups through the Amphitheater at Arlington National Cemetery.